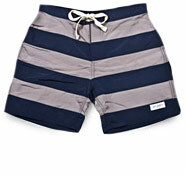 Loose fitting swim trunks became the popular choice in men's swimsuits in the 1930s. in a range of materials and price points. Polyester, with an elastic waistband, mesh lining and 7" inseam. 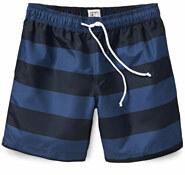 Nylon, trim fit with lace-up waistband, back pocket and 5 ½" inseam. 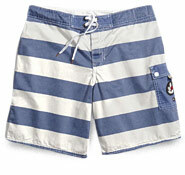 Cotton twill, fuller boardshort fit, with side cargo pocket and 9" inseam. 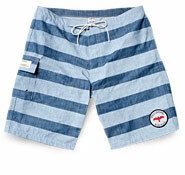 Cotton chambray lined in nylon, with snap fly, side flap pocket and 7 ½" inseam.